As promised, I’m going to be putting up a few more DAX examples here – although they may not demonstrate any new and interesting concepts, I’m still learning the language and blogging is a good way for me to practise implementing common calculations. So, today’s problem is: how do we find the number of distinct customers who bought something in the current time period and who have also bought something in the past? That’s to say we want to count the number of returning customers, as opposed to completely new customers who have never bought anything from us before. This is, basically, a variation on the problem of how to get a distinct count in DAX that Marco has already dealt with comprehensively here, but with aspects of a time intelligence calculation (a topic which is well covered here). I’ll be using two tables from Adventure Works to illustrate this: FactInternetSales and DimDate. 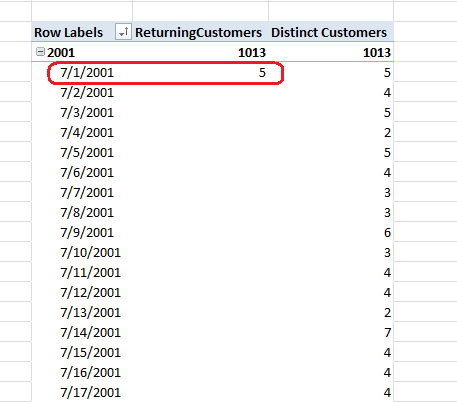 ANDing these two arguments together gives us a context that contains only rows that have a customer that bought in the current time period and dates up to the current time period. It’s a little harder to understand what’s going on here but a lot more elegant, I think. I am doing a scorecard solution with PowerPivot. I am calculating my own status indicators, as PowerPivot KPIs do not support the status indication calcs I am looking for. I am past that :). Now I want to come up with a measure that calculates ‘how green’ is the scorecard we are looking at. Do you have any good advice on how I can count rows in a table that a referencing a measure? Can you give me more details on how you want to do your calculation, with some examples please? 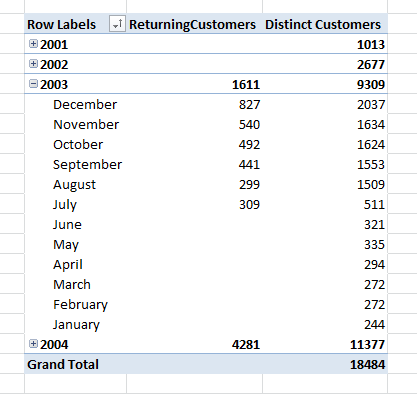 So when I use this in PowerPivot I want to see the fiscal month in my horizontal row labels and then the unique customer count for each period. My date table is joined to my detail table using the invoice date, and I have 2 more inactive joins to the SubscriptionStartDate and SubscriptionEndDate columns within the Detail table. cool – will check it out. Thanks for the info. I’m new to this one and trying to grab the concept of tabular.. Why is the Grand Total is not showing for returning customer? That’s because the Grand Total represents all years – and at that level, because there is no previous year, there can’t be any returning customers. 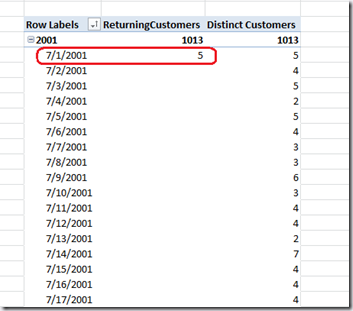 I”m using named set in my mdx queries for new customers so that I could use this named set on row level further to see another measures like Sales and Margins etc. My queries is as follows. It works fine in mdx but I need to do same thing in my tabular model for new customers and top 20 customers. So can we make named set in DAX? If named set functionality is not available in DAX then whats the best alternate of this? I tried to use Calculated Tables but it filter data on company level and stored it in memory after process and when I use it further in excel sheet then it does not work on another filter dynamically. Thanks for any help on it. I need to calculate returning customers but bucket them by if they are current(Shopped within last 12 months) or lapsed(haven’t shopped in last 12 months) or former(haven’t shopped since last 25months or more). I am using dynamic segmentation to created this segments and defined min and max of months that I intend to use in my date filters. the below query works for me if I just want to calculate the number of one type of customer. I am struggling to write DAX that helps me define one metric that calculates the number of all the segments. I want to be able to replace -24 and -13 with min and max from my segment. Any help would be appreciated. Can’t you just replace the -24 and -13 with measures that return the correct values for each segment? Yes, I exactly did that, but the calculation took lot of time and never returned any results.